The book is organized into four chapters. The first three treat distinct types of design variables, and the fourth presents a built-up structure formulation that combines the other three. The first chapter treats finite-dimensional problems, in which the state variable is a finite-dimensional vector of structure displacements and the design parameters. The structual state equations are matrix equations for static response, vibration, and buckling of structures and matrix differential equations for transient dynamic response of structures, which design variables appearing in the coefficient matrices. Preface. Finite-Dimensional Structural Systems. Distributed Parameter Structural Components. Structual Components with Shape as the Design. 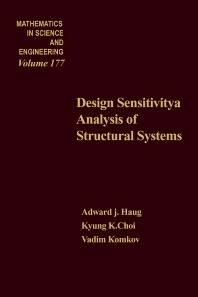 Design Sensitivity Analysis of Built-Up Structures. Appendix. References. Index.